Anastasia Daytime Eyeshadow Quad ($32.00 for oz.) 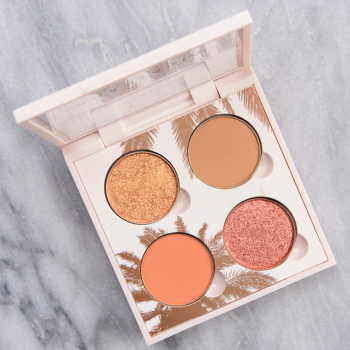 is a new, limited edition quad that features four warm-toned shades–gold, yellowy brown, orange, and rose gold. Those who enjoy the typical Anastasia eyeshadow formula should enjoy this quad, especially with primer, but I found the shimmery shades did not perform as well without a dampened brush. The mattes were a little dusty in the pan, but they both blended well and retained their intensity on my skin. Sunny is a bright, medium gold with stronger, warm orange undertones and a sparkling, metallic finish. The eyeshadow had a denser, slightly thicker consistency that made it harder to apply evenly to certain areas of my skin, as I had to buff and work the powder against my skin to smooth it out. Alternatively, one could use a dampened brush to apply, which helped give it more slip and smoothed out the application instantly. It had opaque pigmentation that stayed on well for eight hours before starting to crease on me. 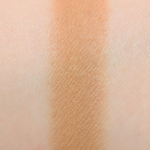 Natasha Denona Sundazed (128K) (PiP, ) is darker (95% similar). Colour Pop Butter Cake (PiP, $5.00) is darker (95% similar). KKW Beauty Armenian (LE, ) is less shimmery, lighter, cooler (95% similar). Colour Pop Lucido (LE, $5.00) is warmer (95% similar). Tarte Hype (PiP, ) is darker (90% similar). Smashbox Revenge Bod (PiP, ) is less shimmery, lighter, warmer (90% similar). Colour Pop Jinxie (LE, $5.00) is less shimmery (90% similar). MAC Oh So Gilty (P, $18.00) is lighter (90% similar). Sand Castle is a muted, light-medium yellowed brown with subtle, warm undertones and a matte finish. The color payoff was opaque, while the consistency was soft, lightly dusty, and drier to the touch, but it applied evenly without losing its intensity and blended out easily along the edges. 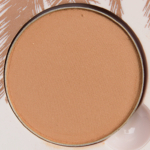 It seemed to darken just slightly, almost going grayish at times, which almost worked out since it was in my crease area, but it definitely changes noticeably during application. It lasted nicely for seven and a half hours on me before it started fade a bit. LORAC Burlap (LE, $19.00) is darker (95% similar). Sephora Khaki (LE, ) is darker (95% similar). Bad Habit Floating (PiP, ) is warmer (90% similar). Natasha Denona Sand Stone (PiP, ) is darker (90% similar). NABLA Cosmetics Narrative (PiP, $8.00) is warmer (90% similar). MAC That Somebody (LE, $17.00) is darker (90% similar). Too Faced Chihuahua (LE, $16.00) is lighter (90% similar). Anastasia Custard (P, $12.00) is lighter, cooler (85% similar). Surratt Beauty Chameau (P, $20.00) is lighter, cooler (85% similar). Sydney Grace Nature’s Crown (PiP, $5.00) is darker, warmer (85% similar). 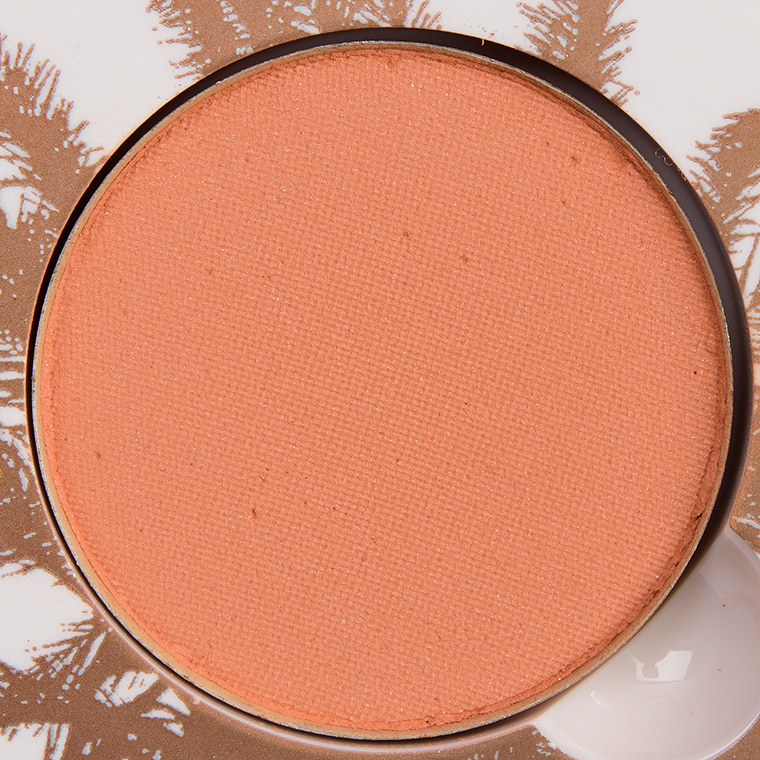 Papaya is a soft, medium orange–almost like a burnt orange–with a mostly matte finish. 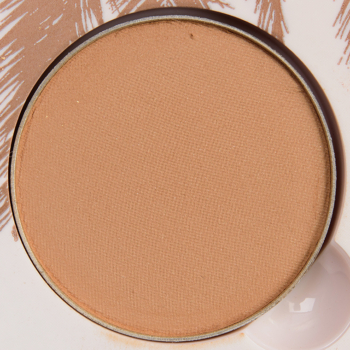 It had nearly opaque pigmentation with a soft, lightly powdery consistency that was easy to blend out but not prone to fallout nor did it lose its intensity when applied to my skin. It wore well for seven and a half hours before fading slightly on me. Colour Pop Sorbet (LE, $5.00) is less shimmery, lighter (95% similar). Makeup Geek Peaches (LE, $6.00) is less shimmery, cooler (95% similar). Colour Pop Lola (LE, $5.00) is less shimmery, darker, brighter (90% similar). Colour Pop Thic (LE, $5.00) is less shimmery, darker, cooler (90% similar). 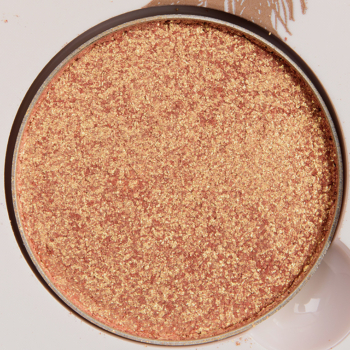 Dominique Cosmetics Pumpkin Spice (PiP, ) is less shimmery, lighter (90% similar). MAC Get Closer (LE, $17.00) is more shimmery, warmer (90% similar). Coloured Raine Natural (LE, $6.99) is less shimmery, darker (90% similar). Chanel Rouge-Gorge (116) (LE, $32.00) is more shimmery, cooler (90% similar). 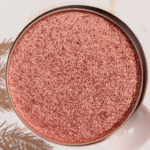 Sydney Grace Peach Crush (P, $5.00) is less shimmery, lighter (90% similar). 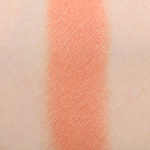 Make Up For Ever M720 Apricot (P, $17.00) is less shimmery, lighter, cooler (90% similar). Rose Quartz (Daytime) is a light-medium, rosy copper with warm undertones and a metallic sheen. It had rich color payoff in a single layer, which adhered evenly and smoothly to my bare lid, though I felt like the shimmer was more muted without applying it with a dampened brush. The consistency was soft, blendable, and easy to work with without fallout. It stayed on well for eight hours on me before I noticed slight fading. Colour Pop Late Night (PiP, $5.00) is more shimmery, cooler (95% similar). 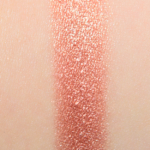 NABLA Cosmetics Rose Gold (PiP, ) is less shimmery (95% similar). Dose of Colors Try Me (LE, ) is more shimmery (95% similar). Colour Pop Lust in Time (LE, $5.00) is less shimmery (95% similar). Laura Mercier Star Ruby (LE, ) is darker (90% similar). Anastasia Rose Pink (PiP, $12.00) is less shimmery (90% similar). Colour Pop Misty (P, $5.00) is less shimmery, darker (90% similar). YSL Paris #5 (LE, ) is lighter, cooler (90% similar). Viseart Grande Pro (Vol. 2) #11 (LE, ) is warmer (90% similar). MAC PatrickStarrr (LE, $21.00) is warmer (90% similar). What’s one product you often forget to use?